FLNG & FSRU: Which ones will clear the investment hurdle? IMA/World Energy Reports has just completed a 12-month detailed assessment of the floating liquefaction and regasification market. 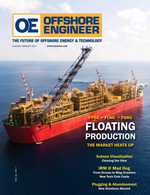 The 150+ page study examines future market opportunities in floating liquefaction and regasification, systematically assesses the universe of floating liquefied natural gas (FLNG) and floating storage regasification unit (FSRU) projects in the planning stage and assigns to each project a probability of clearing the development investment hurdle. An accompanying online database updates all FLNG and FSRU projects on a 24/7 basis. Some highlights from the study are provided here. Global demand for natural gas is expected to grow at an annual rate of 1.5% to 2% over the next 25 years, driven by the economic and environmental advantages of natural gas as feed for heat and power production. Much of future gas demand growth will be in locations where gas delivery by pipeline is either uneconomic or impracticable. These locations, primarily in Asia and Europe, will produce a growing requirement for natural gas in refrigerated liquid form – which will generate demand for additional liquefied natural gas (LNG) production capacity. LNG liquefaction has historically been a land-based activity. Until three years ago, production of LNG took place entirely in land-based plants. 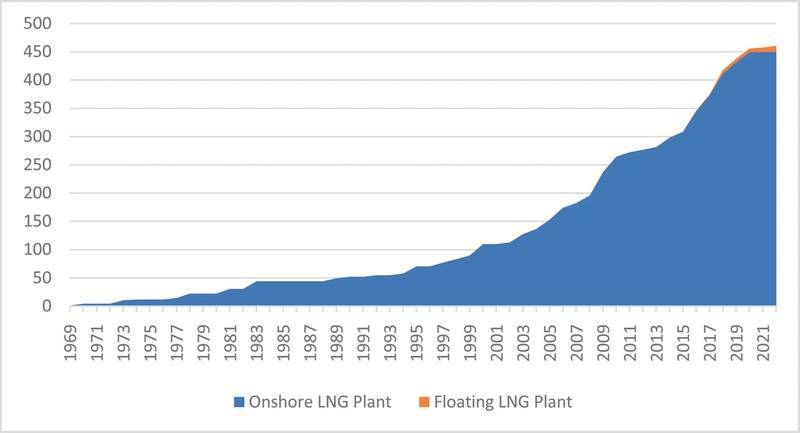 But floating LNG plants have advantages over land-based alternatives in certain situations, and FLNGs now account for around 3% of LNG plant capacity in service or scheduled to be operational within the next two years. FLNGs positioned offshore on a gas reservoir eliminate the need for subsea pipeline to a shore-based LNG plant. Liquefied gas can be produced on the FLNG and directly transferred to an LNG carrier for global delivery. 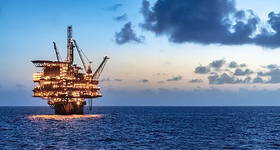 Also, an FLNG does not occupy valuable land space, avoids some time-consuming land permitting requirements and the production unit can be relocated when the reservoir is no longer economical to produce. In general, floating plants tend to be most competitive as the development solution in projects (1) distant from shore, (2) on smaller reservoirs, (3) with difficult flow characteristics and (4) where no existing land plant is within tieback distance. But land and floating plant solutions each have merits and demerits, and the specific circumstances of the planned liquefaction project will determine the optimum development solution. Three of the four comlpleted FLNGs are currently in service: Prelude, PFLNG Satu, Hilli Episeyo. As of this writing, the fourth, Tango, is in transit to the production site in Argentina. Three more FLNGs are on order: Coral South, PFLNG Dua and Gimi. The range of FLNG designs and plant capability is quite diverse. 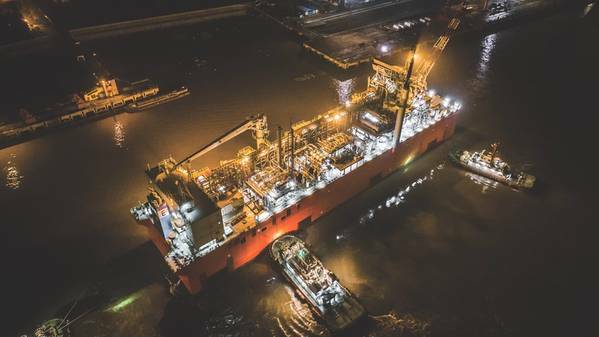 Shell’s 488- by 74-meter Prelude, which began operations off Australia in December 2018, has 5.3 mtpa LNG/LPG/condensate production capability. Prelude has the distinction of being the most expensive vessel (of any type) ever built. Gimi, a 40-year-old LNG carrier being converted by Golar to a 2.5 mtpa FLNG, is the first of several FLNGs to be used by BP to develop deepwater gas/oil discoveries offshore Mauritania/Senegal. It is similar to the Hilli Episeyo FLNG now operating offshore Cameroon. Tango, a purpose-built 0.5 mtpa LNG production barge owned by Exmar, will be used for seasonal LNG production in Argentina. Looking forward, 28 floating liquefaction projects are at various stages of planning and design. 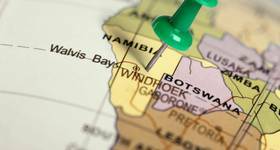 Eleven of these projects are in Africa, seven in Australia/Southeast Asia, five in North America and five in other areas of the world. 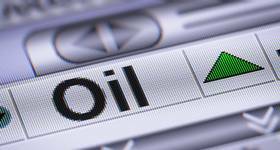 While all have the potential of becoming FLNG contracts, not all will move to development. Some, perhaps many, will not even make the investment hurdle. 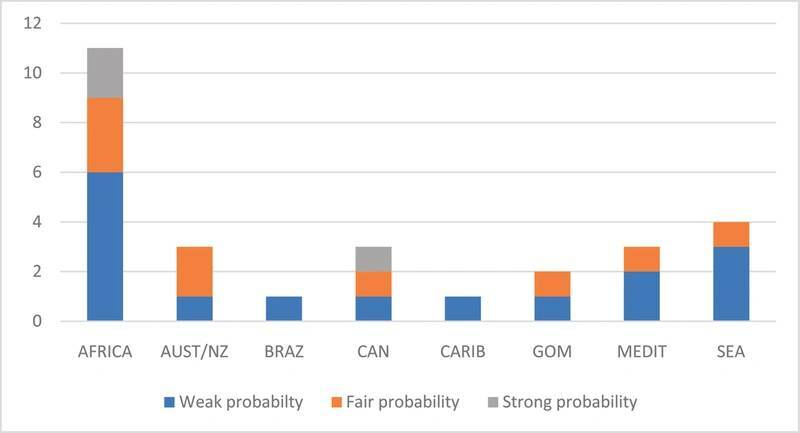 Based on our success factors assessment, three of the planned projects in the planning queue have a strong probability (~80%) to proceed to development, nine have a fair (~50%) probability and the remaining 16 projects have a weak probability (~30%). The three projects rated strong have full government support, strong offtake buyer, rich gas with a local propane/butane market and relatively few technical barriers. Some of the projects with weak probability need to overcome host government opposition to offshore LNG production. Others are rated weak due to financing hurdles. For example, in our evaluation of the Greater Tortue project in Senegal/Mauritania we gave a positive rating to most of the project attributes. The upstream site is in deep water, which is a negative. But this was offset by the lack of alternative commercialization options apart from LNG, support of the two governments and a determined BP as development operator and offtaker. Overall, we gave this project a strong probability of proceeding to development. In December 2018 BP made the FID, and the initial FLNG is under construction. In contrast, we rated the Fortuna FLNG project in Equatorial Guinea as having a weak probability of moving forward to development. While there were some important positives, the success potential was negatively impacted by technical risks associated with its deepwater location, a high methane percentage that lowered potential revenue as there were no liquids to sell and relatively weak financial strength of the developer. This project was recently shelved and the developer took a $610 million impairment charge. As the LNG trade expanded globally since the 1960s, so did requirements for import terminals to store and regasify LNG. The number of import terminals roughly doubled between 1980 and 2000 – and quadrupled between 2000 and 2019. In 2000 five countries had LNG import terminals. Now 43 countries have the ability to import and regasify LNG. Until 14 years ago, all LNG regasification terminals were land-based facilities. 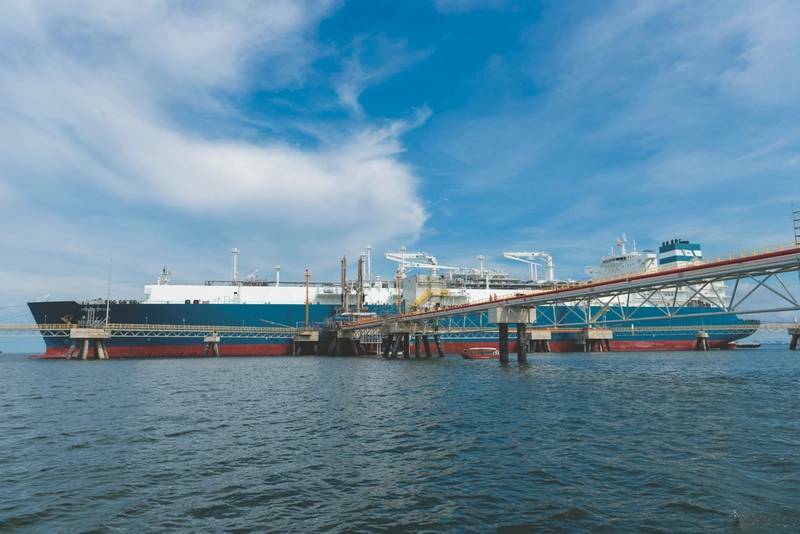 But floating LNG terminals have been gaining market share since Excelerate’s Gulf Gateway offshore terminal was installed in the Gulf of Mexico in 2005. 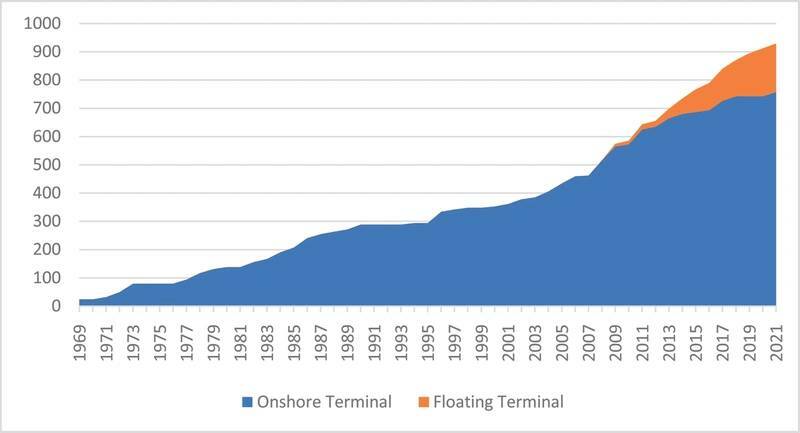 Floating regasification terminals now account for around 15% of global LNG regasification terminal capacity – and the market share percentage will increase to around 18% by 2022 counting terminals now under construction. Floating LNG import terminals have a number of advantages over land terminals. Perhaps the biggest advantage is the ability to minimize first cost by leasing the FSRU rather than investing in a fixed land facility. Other advantages include the terminal can generally be built quicker, FSRUs can be relocated when the import requirement changes and the unit can be used for seasonal demand peaking and employed as a transport carrier in off-peak periods. Another advantage of FSRUs is they arrive on site as finished, turnkey regasification units requiring only hook up to the gas delivery pipeline (at least that’s the plan). Twenty-nine FSRU terminals are in operation and another 17 FSRU terminals are under construction. Of the FSRUs in operation, nine are in Southwest Asia, six in the Mediterranean, five in South America, four in Southeast Asia and five elsewhere. A few of these terminals are a combination of floating storage with land regas plant. Most of FSRUs in service are essentially standard LNG carriers fitted with a modular regasification plant. Newer FSRUs generally have capacity to store 160,000 to 170,000 m3 of LNG and are capable of providing 600+ mmcf/d gas offtake. A few FSRUs with more than 200,000 m3 storage have been built. 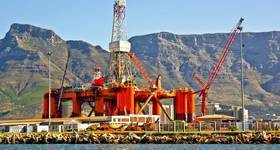 There has been recent interest in building small FSRUs to use as terminals with low gas import requirement. Looking forward, 51 additional FSRU terminals are at various stages of planning. Sixteen of the planned terminals are in Southwest Asia, nine in Southeast Asia, eight in South America/Caribbean, six in Africa and 12 are in other locations. The success factors for FSRU terminals more heavily reflect the commercial aspects of the project – especially the ability to obtain project financing, which can be very difficult when terminal revenue is dependent on local offtakers. Several FSRU projects in which we have been involved hit a barrier when the offtaker take-or-pay contract was not acceptable to prospective lenders and/or the government was not willing or able to provide a sovereign guarantee for the offtake contract. 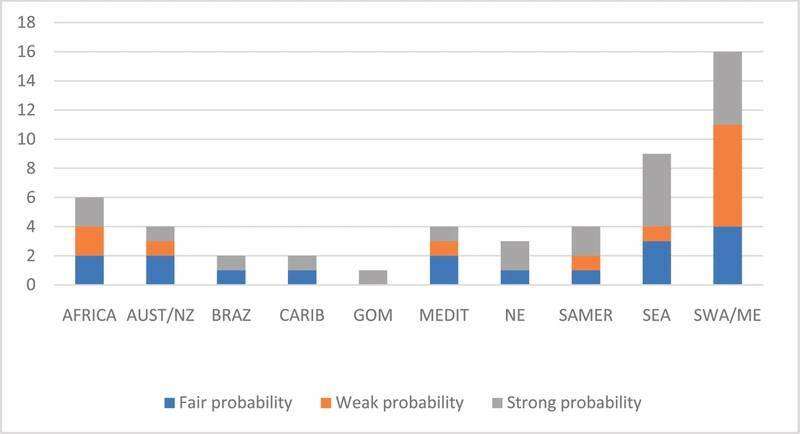 Based on our assessment of the 51 FSRU terminals in the planning queue, 21 have a strong probability (~80%) to proceed to development, 17 have a fair probability (~50%) and 13 a weak probability (~30%). Strong FSRU projects generally have a powerful promoter, strong offtaker, moderate infrastructure requirement and are in a country where it is relatively easy to do business. Uniper/MOLs proposed FSRU terminal in the port of Wilhelmshaven is an example of a strong project. While the terminal will need to compete with pipeline gas, the project is backed by two strong players, terminal infrastructure needs are minimal, Germany is a relatively easy country in which to do business, LNG bunkering is a growing activity in Northern Europe and the project is driven by a need to have alternative gas supply sources for energy security. Many weak projects have alternative gas sources (some being developed offshore), face financing barriers due to weak promoter and/or offtaker and/or would need relatively extensive infrastructure improvements to support a terminal.